3:22 AM on April 5 I started having pressure waves (Hypnobabies word for contractions). They lasted for about 3 hours and then tapered off. I listened to Your Birthing Time Begins (Hypnobabies reminder of all tools, track, and cues to use during birth) and Birthing Day Affirmations and Deepening Your Hypnosis (Hypnobabies hypnosis track to deepen the level of hypnosis). I was able to get a few more hours of sleep because the Deepening Your Hypnosis track was so relaxing. I had mild cramping and mild waves all day. I just knew that my birthing time (Hypnobabies word for labor) was near. At 8 PM April 5th, the waves started to move lower and I could start to feel my cervix opening with each wave. The waves continued and were 11 minutes apart for about an hour and a half. Around 11 they became more sporadic. I had a hard time going to sleep. So, I got up and listened to Hypnobabies Special Safe Place (Hypnobabies hypnosis track that creates a special place for mom and baby) and Deepening Your Hypnosis several times and Birthing Day Affirmations. I tried to get some sleep and would have 2-3 very strong waves per hour which made it hard to sleep. Finally got a decent sleep between 4-6 am. 6 am the waves really picked up in intensity and were 9 minutes apart. I got out of bed after an hour and the waves continued. I listened to Birthing Day Affirmations and relaxation music. Jeremy, my husband made me breakfast. I took a shower and we went for a walk. Waves were about 10-11 minutes apart. Our dog wouldn’t leave my side and the cat was neurotic. I just knew this was my birthing time. I ate half of a green chili burrito and then my waves really picked up after that. Jeremy and I went to get coffee at Dutch bros and I kept timing my waves. They were consistently 8-9 minutes apart. I started feeling them a lot in my back and that was causing some discomfort. Our doula Heather had mentioned some Spinning Babies moves that could help with any back waves. We asked her to come over and show us some Spinning Babies and counter pressure techniques. She came and had me lay upside down from the couch. I think that realigned baby and I was much more comfortable after that. She also showed my husband some counter pressure moves that would help with any discomfort during a wave. After she left I laid down and listened to Deepening track in hopes of getting some sleep. The waves were too strong so I decided to take a bath while listening to Easy First Stage (Hypnobabies main birthing time track). My waves really picked up and I had 5 waves 5 minutes or under. I texted the birth center and let them know. They said to have Heather come to the house and continue my birthing time at home. I texted Heather and asked her to come over. I am so glad she had shown Jeremy the counter pressure because my waves really picked up in intensity and I started to feel like I was going to throw up. I asked Jeremy to start the counter pressure and I was able to regain my relaxation and started ooooing through my waves. Heather arrived around 5:30 and gave Jeremy a break. She started to press on my hips during a wave and that really helped to open up my hips. It got to the point where I not only had discomfort free waves but I actually looked forward to the next wave. I was able to breathe and oooo through them and picture my cervix Open Open Open. We had Easy First Stage playing and the Relax (Hypnobabies cue to deepen hypnosis) and Release (Hypnobabies cue to instantly go into hypnosis) cues helped me to further surrender to the waves. I was able to completely relax no tension or fighting the waves. The affirmation “I trust my body knows exactly what to do and I feel good about it” kept running through my mind and I was able to do just that! I started to feel something similar to a runners high. I felt so in control and powerful over the waves as I trusted my body. My waves were quickly progressing to 2-3 minutes apart. Heather began heat compression with lavender oil. The waves were intense but I had such a deep sense of calm that I was actually enjoying them knowing that “each wave brings me closer to meeting my baby” The cues in the Easy First Stage track made it easy to stay present during each wave and relax into each wave. We called the birth center and let them know where the waves were at. They said since I hadn’t lost my mucous plug/ no bloody show and my water hadn’t broken to wait it out for a few more waves. I went to the bathroom and lost my mucous plug there. 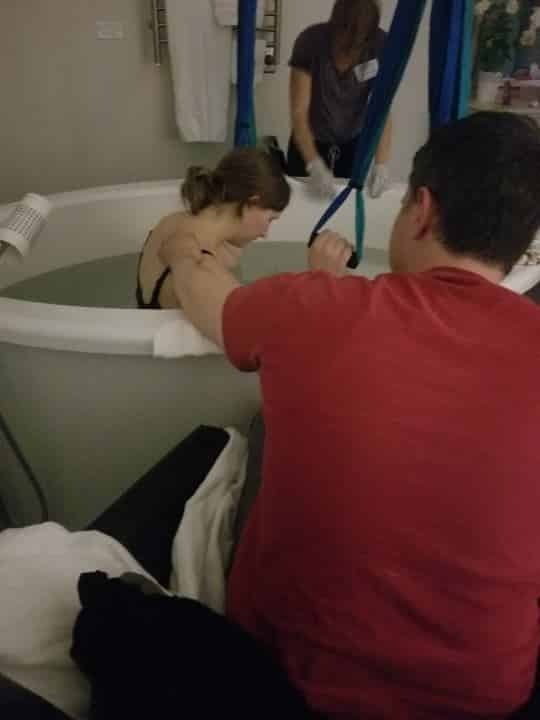 My husband called the birth center back and told them. 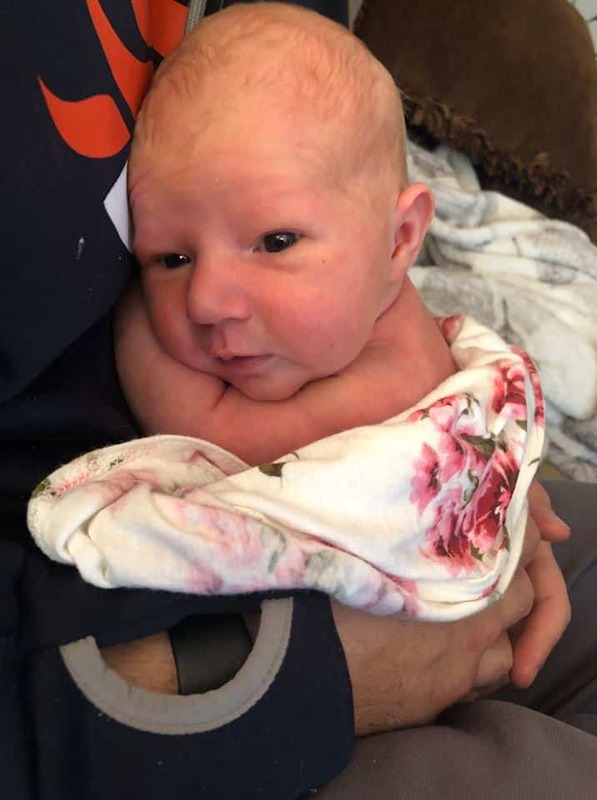 They said it was up to me but we could head to the Birth Center when I was ready. I was starting to feel the waves changing from opening my cervix to pushing waves. So, we left for the birth center. I put my headphones in and continued to listen to Easy First Stage. 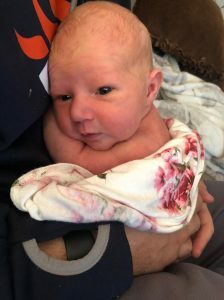 I was completely comfortable the entire 20-minute drive to the Birth Center. On the drive, I felt baby move deep into my pelvis. We arrived at the birth center and I had a few waves walking in. I was still able to smile at the nurse who introduced herself to me and showed us our room. I asked them to fill up the tub right away. I got in and was so relaxed that my waves slowed way down. I started to worry but told myself “I trust my body knows exactly what to do and if it needs to rest for a minute I will surrender to the rest.” After about 20 minutes my waves picked up and were definitely pushing waves. During one wave the pressure popped my waters. That was the most amazing experience. That gave me a burst of energy to know that we were so close to meeting our baby girl. I then pushed for 40 minutes and my husband caught her as she came out. He put her on my chest and we had the sweetest first moments of a family of three. We then slowly moved out of the water and into the bed. As soon as we were dry and on the bed, she immediately latched and started breastfeeding! 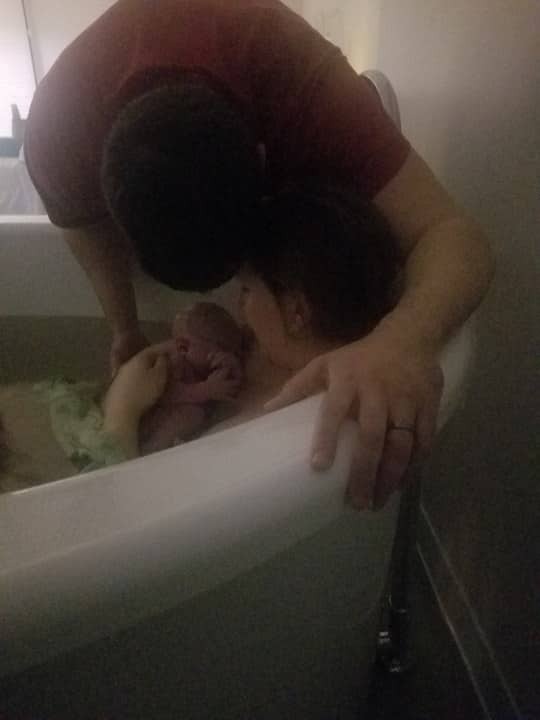 My midwife and nurse said that was one of the most peaceful births they had seen for a first-time mom. I am thankful for Hypnobabies for helping me to not only have a peaceful, pain free, empowering birth. I look forward to my next birthing time with eager anticipation! I also appreciated how Hypnobabies prepared my husband as a birth partner. He was there every step of the way and felt confident in how to support me. 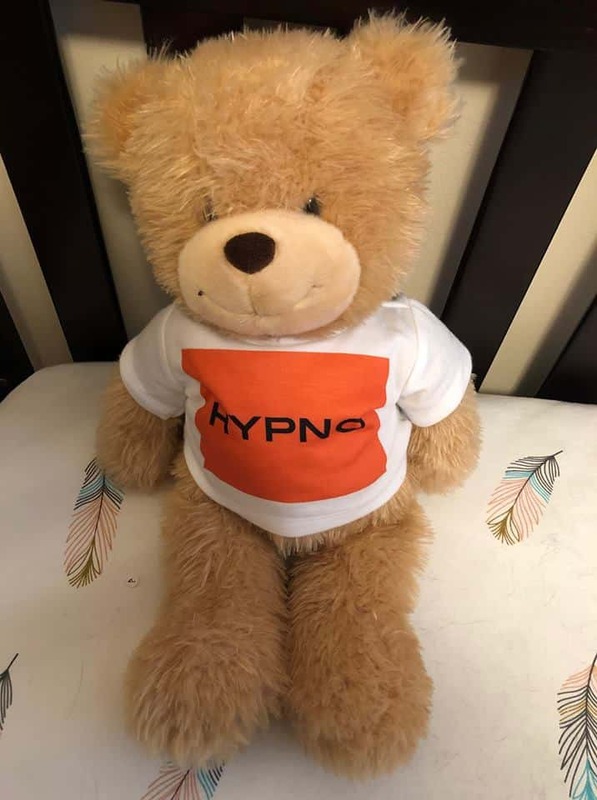 He even made a Hypno-bear to remind me of my orange glowing hypno-anesthesia. Thanks, Hypnobabies!